This is part two of a three part series on Limits to Growth. Part one can be accessed here and part three can be accessed here. In part one of this series, I explained the Limits to Growth archetype and gave examples in epidemiology and ecology. 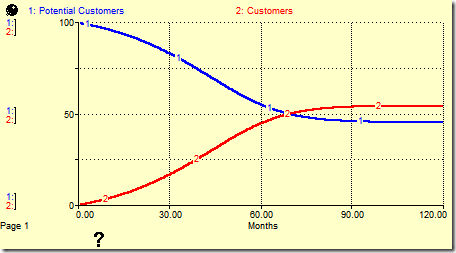 This part introduces the Bass diffusion model, an effective way to implement the capture of customers in a developing market. 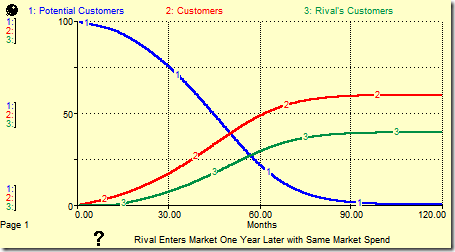 This is also used to implement what Kim Warren calls Type 1 rivalry in his book Strategy Management Dynamics, that is, rivalry between multiple companies in an emerging market. The Bass diffusion model is very similar to the SIR model shown in part one. Since we do not usually track customers who have “recovered” from using our product, the model only has two stocks, corresponding loosely to the Susceptible and Infected stocks. New customers are acquired through contact with existing customers, just as an infection spreads, but in this context this is called word of mouth (wom). This is, however, not sufficient to spread the news of a good product, so the Bass diffusion model also includes a constant rate of customer acquisition through advertising. This is shown below (and can be downloaded by clicking here). The feedback loops B1 and R are the same as the balancing and reinforcing loops between Susceptible and Infected in the SIR model. Instead of an infection rate, there is a wom multiplier which is the product of the Bass diffusion model’s contact rate and the adoption rate. If you are examining policies related to these variables, it would be important to separate them out in the model. 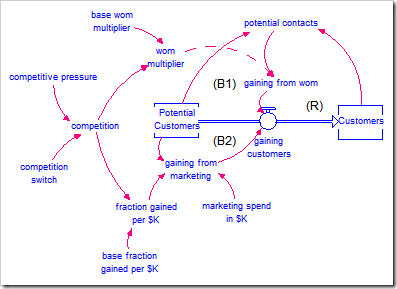 The additional feedback loop, B2, starts the ball rolling and helps a steady stream of customers come in the door. If you examine the SIR model closely, you will see that the initial value of Infected is one. If no one is infected, the disease cannot spread. Likewise, if no one is a customer, there is no one to tell others how great the product is so they want to become customers also. By advertising, awareness of the product is created in the market and some people will become customers without having encountered other customers who are happy with the product. The behavior of this model is shown below. Note it is not different in character from the SIR model or the simple population model. In the face of competition for an emerging market, multiple companies will be fighting for these same potential customers. Ostensibly, they all follow the Bass diffusion model. However, if the exact dynamics of the competition is not important to the purpose of the model, it is possible to simply model the reverse pressure the competition is placing on your company’s growth. 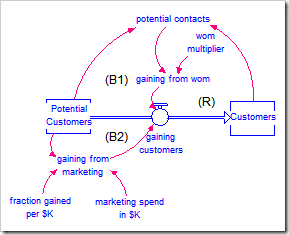 In this version of the model (which can be downloaded by clicking here), both the wom multiplier and the marketing effectiveness (fraction gained per $K) are restricted by competitive pressure. 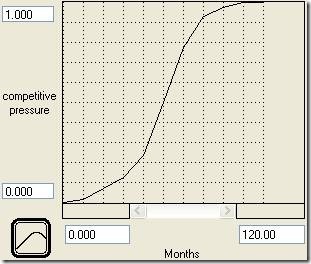 The variable competitive pressure is an S-shaped graphical function meant to mimic the behavior of competitors in a developing market. In the beginning, there is no competition. As the market grows, more and more competitors enter the market until it becomes saturated. 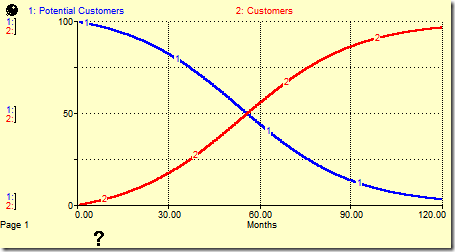 It is a simple time-series function, as shown below, but could instead be tied to the success of your company. The variable competition is just 1 – competitive_pressure, i.e., it is a multiplier that reduces the effectiveness of wom and marketing spending as competitive pressure grows. Finally, a switch called competition switch has been added. When this is set to zero (the default), the model behaves as it did previously, i.e., without competition. When it is set to one, competition is active and the behavior changes to that shown below. Finally, another competitor can be explicitly modeled by replicating the structure (or by using arrays). This model is shown below (and can be downloaded by clicking here). This model does not include the process of developing a market for a product nor does it model persons leaving the market. I.e., it is assumed that the total market size is predefined and never changes. For a completely new product, the potential market will likely grow, so we may want to include this effect. However, when modeling a developing market, it is unlikely we are interested in the shrinking of the market that occurs after maturation. 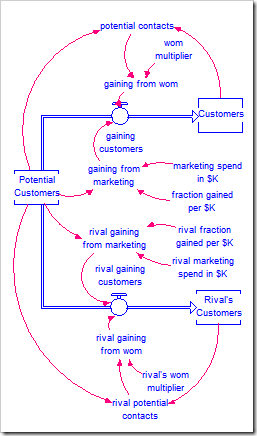 The model also does not model losing customers to competitors (Type 2 rivalry) or customers who use products from multiple competitors (Type 3 rivalry). An example of modeling Type 2 rivalry is shown in a previous post. My next post in this series will expand the above model to include Type 2 rivalry and to use arrays.